Stormy skies, massive amounts of rain, temperatures hovering in the 40s and 50s. Everyone knows I could only be referring to Death Valley National Park. 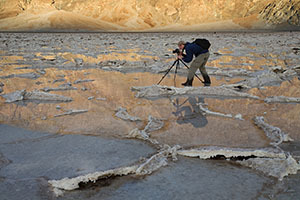 They call Death Valley a "Land of Extremes" and there was no better example than this past weekend on the Aperture Academy's Death Valley workshop. On a rainy Friday evening, our group assembled in the Furnace Creek Inn to go over introductions and logistics for the weekend. It was fitting that outside it was pouring rain, because weather was the main topic of conversation inside as well. "What if it rains ALL weekend?" What most participants in our workshops don't see is all the hard work and preparation our instructors put in behind the scenes prior to their arrival. All of Thursday and Friday Stephen and Brian scoured the valley checking conditions and preparing schedules to maximize photography, no matter what the weather decided to do. Inclement weather often yields the best photography...and we want our group to ALWAYS be in the right places at the right times. After everyone felt comfortable that the schedule was under control, we let them go off to get a good night's rest. We were meeting at 5:15am to head out on our first shoot. Rain or shine. You know, 5:15am comes early...no matter how much you like photography. We met our sleepy-eyed group, and all set off for Zabriskie Pt. The valley was socked in with clouds, but if there was decent light to be found that day, it was going to be from Zabriskie. 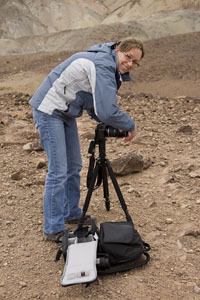 We arrived at the parking lot first, as was our goal, and our group got set up in the optimal position for sunrise. 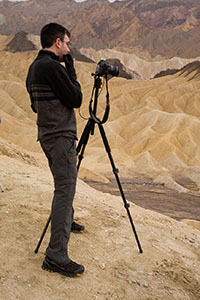 In popular places like Death Valley, iconic locations like Zabriskie can fill quickly with other photography classes and individual photographers, so we made sure our group was locked into the best spots before we had any competition. While we waited to see what the sun was going to do, we worked with the students on composition and helped them with any questions they had about ISO, aperture or shutter speed. 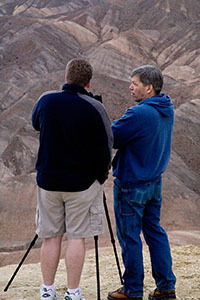 We also briefed them on which filters they would find most useful in this location. Even though the light never fully materialized the way we'd hoped, we still made the most of our first shoot. 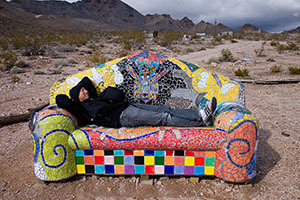 Even without color, Zabriskie offers many opportunities to create nice compositions that show off the varied layers and colors. Students also had a chance to work with a blue n' gold polarizer to see how effective it was at bringing out the warm tones in the scene. 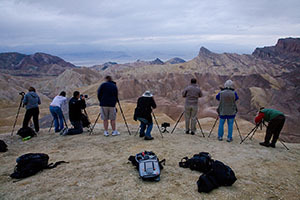 When we left Zabriskie, there were at least 30 other photographers in the area...a good indication that we had made the right decision showing up early. 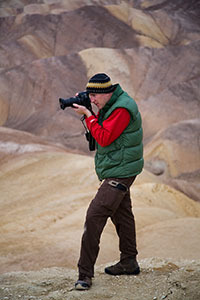 From Zabriskie, we drove down the road to photograph some of the dramatic and moody fog that was clinging to the mountains. 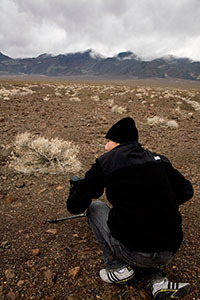 We spent time helping students wander this desolate landscape looking for some of the unique plants that make their homes in this land of extremes. Because of the dark skies and dark earth we made an effort to focus on monochromatic images that brought out the contrast of light and dark, as well as life and death in the scene. 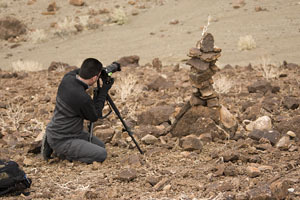 The rest of our time before lunch was spent on "Artists Drive," where we stopped numerous times to photograph the many diverse rock structures and the bizarre array of colors. Green, blue, red, purple, gold, white, and even turquoise, this area had it all. The recent rain had further added to an area already drastically shaped by erosion, creating deep grooves we could use to help as leading lines into the many different compositional possibilities the drive provided. We rewarded the hard work of the morning with a lunch set up for the students by their instructors in the Gold Canyon parking lot. Students took the opportunity to refuel, get to know one another more, and try to get some strength back for the afternoon. 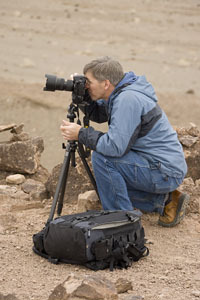 Our goal at all our workshops is to keep students in the field shooting as much as possible. 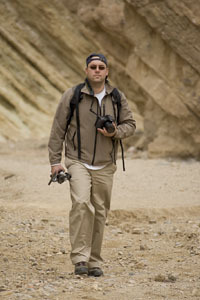 When lunch was done, we headed into Gold Canyon to explore the diverse blend of brown and gold rock. For some, this was their favorite spot of the day. 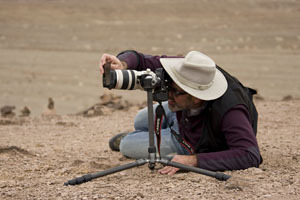 The area provides so many opportunities for wide angle work, in addition to many smaller details that could be used for macro or abstract images. This was a great group...their enthusiasm was often hard to corral, and the minute we arrived in a new location they would scatter about looking for unique compositions. 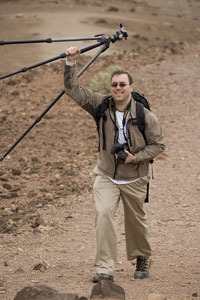 This can also be attributed to Death Valley. Every turn provides a new set of colors and shapes that look like something from another planet....and when it's not 120 degrees outside, it's much easier to be enthusiastic about photographing it. After a good hike up Gold Canyon, before heading out to the "Devil's Golf Course," we took a brief stop in Furnace Creek for some snacks. The road to the golf course was closed due to mud, and we were forced to make the mile-plus walk out...stopping only occasionally to photograph the cracked mud. The sky was looking ominous at this point, which was a perfect compliment to the harsh and menacing structures stretching out before us. Students worked on creating good composition that would lend themselves to being converted to monochrome. 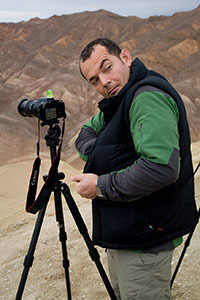 This area is a GREAT spot for shooting repetitive shape, and using curves to guide the viewers' eyes through an image. It's always a blast to watch the students' oooh and aaaaahhhh as they continue to be amazed as every new location appears more bizarre than the last. Unfortunately the weather decided to come into play again, and rain drove us away after only completing seven of our nine holes. 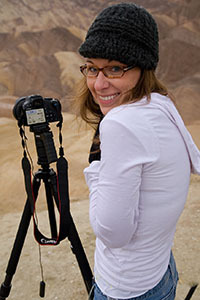 Rather than be shot down completely, we opted to head to Badwater to give sunset a go. The skies had been playing games with us all day. One minute it would seem promising, and then quickly change to dark and ominous. As we drove to the salt flats of Badwater, our hopes were high that the sky would be in one of its promising phases when we arrived. However, this is a land of extremes, and in the time it took us to get to Badwater, the sky went from possibly being dark and ominous with little rain to being ominous and pouring. We tried our best to wait out the rain...however, the system wasn't moving fast enough, and if there was a sunset to be had, it wasn't in this section of the park. 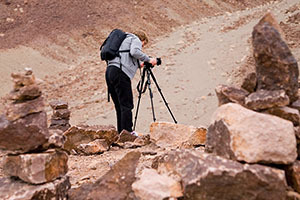 Luckily, we had filled the early portions of the day with lots of photography and most of the students were ready to head back to Furnace Creek to eat the dinner that had been slowly cooking to perfection in a crock pot for them during the 12 hours they'd spent in the field. The Crockpot has become a tradition on all our Aperture Academy 2- and 3-day workshops. 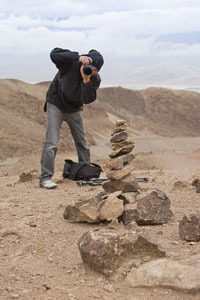 This tradition began on a Death Valley trip similar in many ways to this trip -- full of photography and rain. So we well knew from experience that nothing wraps up a long day of photography better than slowly cooked pork and warm tortillas. How better to get a good night's rest than putting yourself in a pork coma? Stephen took his group back to start pork dinner preparations, while Brian took his group up the road a bit to see if the conditions were looking any different. 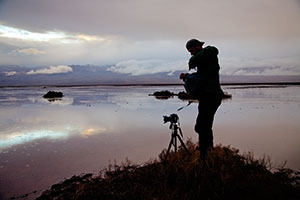 Shockingly, 15 miles past Badwater the group found a break in the storm, and were able to photograph a rare scene of water and reflections in Death Valley. 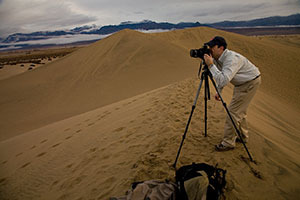 One student put it perfectly, "I bet if you showed this photo to people and had them guess where it was taken, Death Valley would be one of the last guesses." 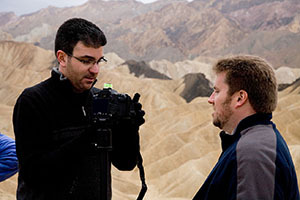 When at last everyone was back in Furnace Creek, dinner was setup, and with special thanks to Chris for allowing the group to use his room, everyone ate and finished up a great first day of exploring Death Valley National Park. Despite the camaraderie and fun everyone was having over dinner, we needed to keep the party to a minimum. It was going to be another 5:15am departure time in the morning, as we set out to explore another side of the park. 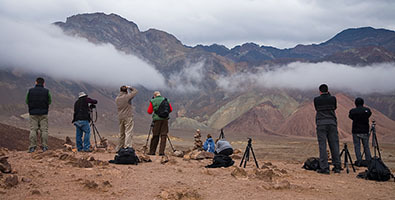 While our group slept, the rains came into Death Valley with a vengeance. We met in the morning under gloomy, wet conditions. Despite dark clouds, at Aperture Academy, we remain constantly optimistic. 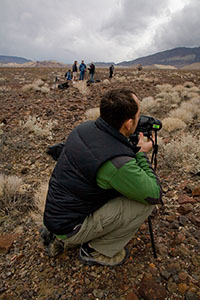 Our instructors know too well how conditions can change in the blink of an eye, and especially in a park the size of Death Valley. What happens in one part of the park can be completely different in another. So, we just loaded and set off for the Mesquite Dunes. When we arrived, it was still raining pretty good, and it took a bit of waiting for conditions to let up enough for our group to start the hike out. 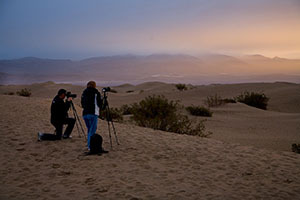 Once in the dunes, however, it was only a matter of time before the light began to get good and the group was excited to start exploring in search of the numerous possibilities in the area. The dunes are amazing, and it was only a matter of time before the group spread far and wide in search of their own take on the vast area. Light was awesome, and when the sky broke the whole valley was a combination of streaky blue sky and white puffy clouds. The Sierra range emerged from its nightly shroud to reveal a new layer of snow. It was an amazing site. We spent a majority of the morning there capturing different compositions, and working with the students more on filter use and using the strong lines of the dunes as leaders into their images. Morning break in Stovepipe Wells was a chance for the class to grab some coffee or their morning sugar rush before setting off up a partially washed out road to Mosaic Canyon. 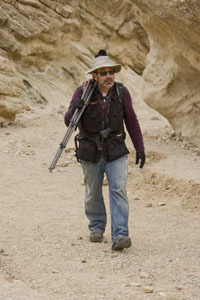 Mosaic Canyon is just another of the bizarre places Death Valley holds. This is a canyon full of different layers of marble and sedimentary rock that have been smushed by time to create different layers of color and texture. 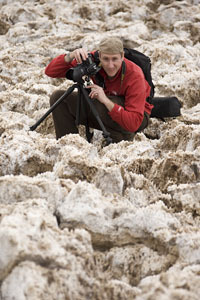 The rains from the previous night left some small cascades, as well as washed off the dust from the canyon walls, leaving them vibrant and full of photographic possibilities. 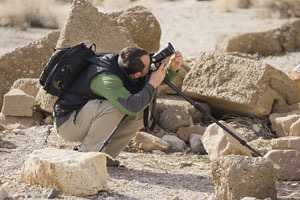 Each turn in the canyon sent students scampering in search of new close-up shots, or an aerial view of the canyon's tighter areas as they curved away into a diverse array of form and color. 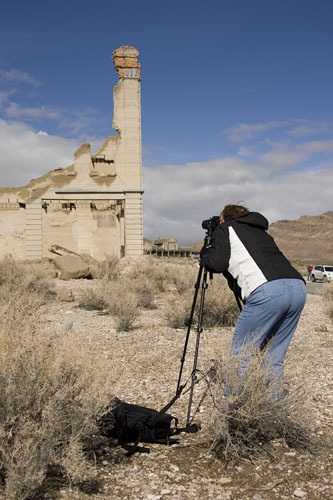 As we continued the day in the ghost town of Rhyolite, the sky just kept on improving. Ghost towns, in our opinions, are a shoot best conducted under stormy, moody skies...which is exactly what we had. In addition to the fun of photographing these decaying pieces of Americana under ideal conditions, most everyone also went back into cell-service for the first time in days, and the strong wind blew a symphony of phones receiving texts and message sounds into the air. 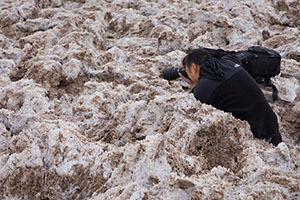 It was a nice bonus for most to be able to have contact with a friend or loved one who feared they might have been washed away in the downpour the night before. 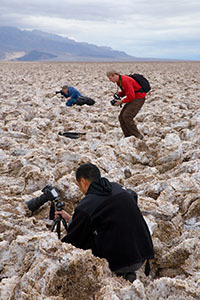 For our last shoot of the workshop, we were determined to make sure the class had an opportunity to see Badwater full of water, which is a phenomenon rarely seen in this park. 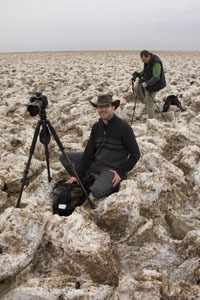 We dubbed the last shoot, "The showdown in Badwater." Badwater had won round one, but we were not going down without a fight...and wouldn't you know it...our persistence paid off and we were treated to the best sunset of the whole week. It was only fitting that in a land of extremes, we ended this workshop in the most extreme looking spot in the park. 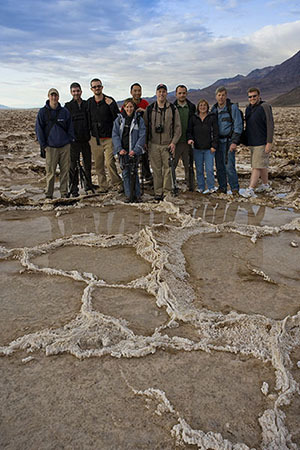 Nearly 300 feet below sea-level, Badwater is an odd mix of white salt hexagon shapes and huge, gnarly cracks erupting from the flats. These cracks form depressions normally bare and full of interesting texture, but due to the rains, were now full of water that was perfect for utilizing the circular polarizer in combination with various grad filters. Most everyone was more than happy to get their feet a little wet in order to have the chance to see this area under rare and ideal conditions. 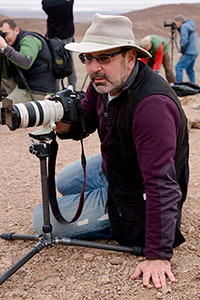 As the light faded, our group, content from a long weekend of photography, wearily made their way back to the vehicles, with many talking about where they wanted to shoot sunset in the morning on their own before leaving the valley towards home. 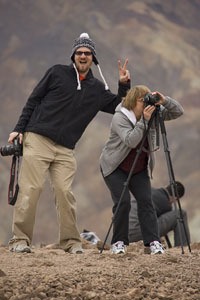 This was a land of extremes, and it threw everything possible at us, yet with a little preparation and tons of enthusiasm from our group, we made it out of Death Valley happy...and everyone left with memory cards full of images to go along with the memories and friends they'd made over the past few days.